Easy and two version Wonton Soup recipe. 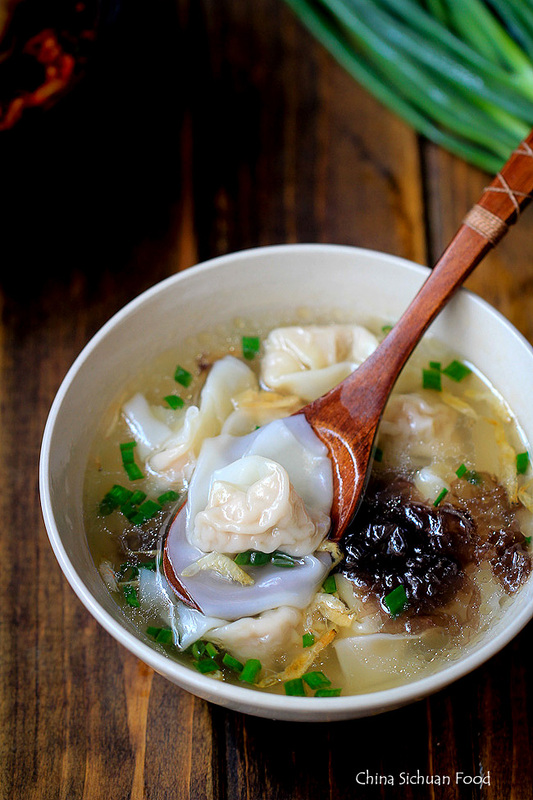 Wonton is one of the favorite snacks especially in the southern part of China. 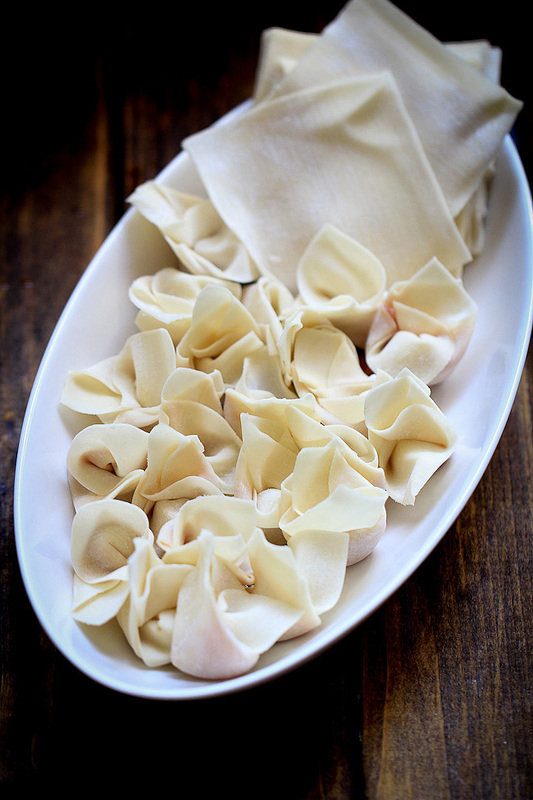 The processing of making wonton is similar with dumplings but the tastes of the two are quite different. Wonton wrappers are always thinner than dumpling wrappers and wonton has a fresher scent comparing with dumplings. The wonton soup is the soup using wonton as the main ingredients. 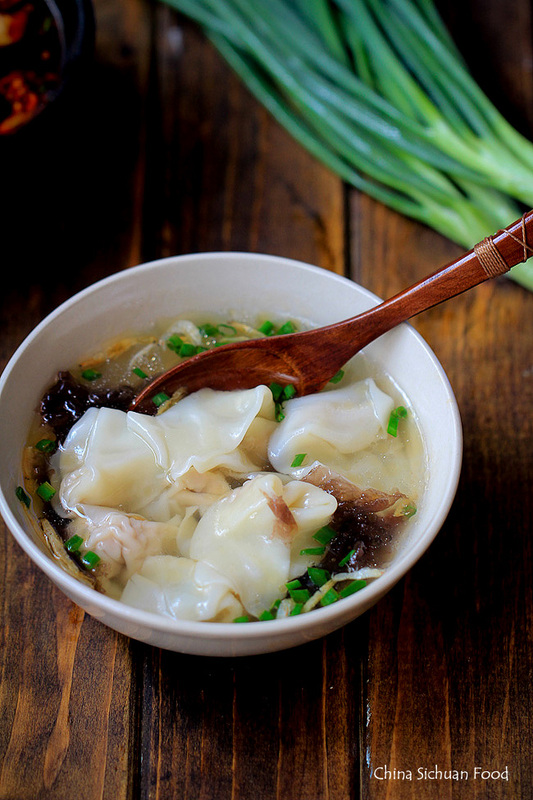 Generally, we have two types of wonton soup quite popular in China. One is clear or mild wonton soup and the other one is wonton soup in red oil. 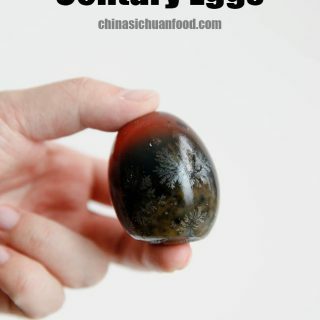 Surely, the later one is more popular in Sichuan cuisine. 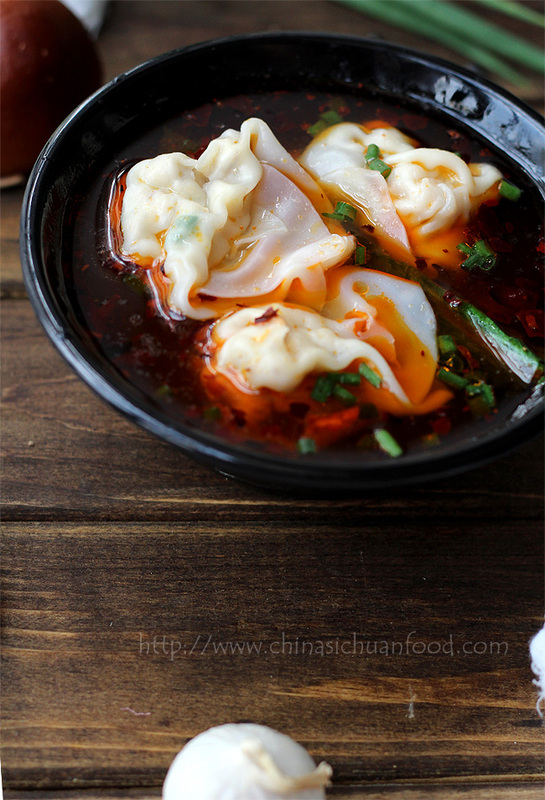 Additionally, it is considered as one of the most classic Sichuan snacks-red oil Wonton soup. 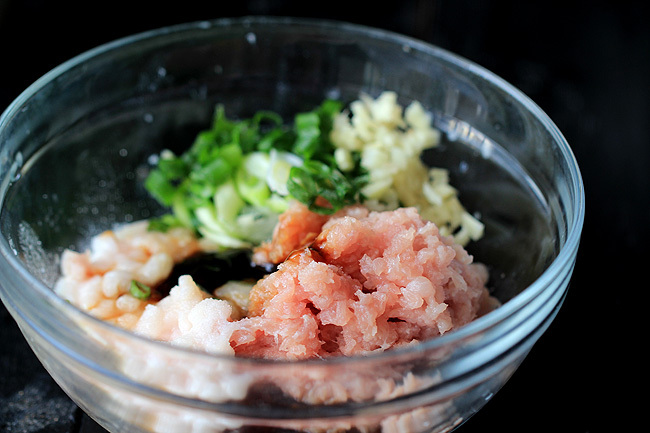 To prepare the wonton filling ground pork (can be combined with beef or chicken or shrimp) green onions, grated ginger,egg as well as other condiments. Of course, sometimes we can add some vegetables or mushrooms for a better healthy balance. 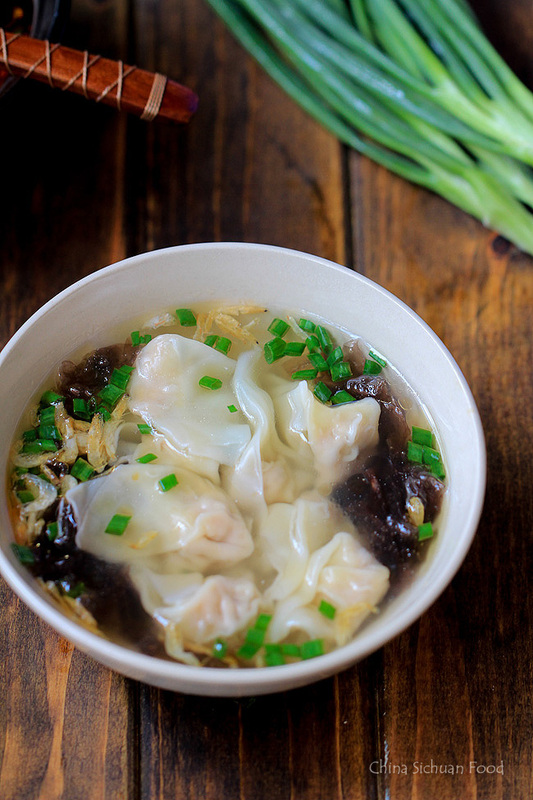 For vegan and vegetarian readers, please refer to this post: vegetarian wonton soup. Assemble the wonton one by one, photo instruction is here: how to wrap wontons. Now let’s make Wonton Soup broth for both spicy version and mild version. 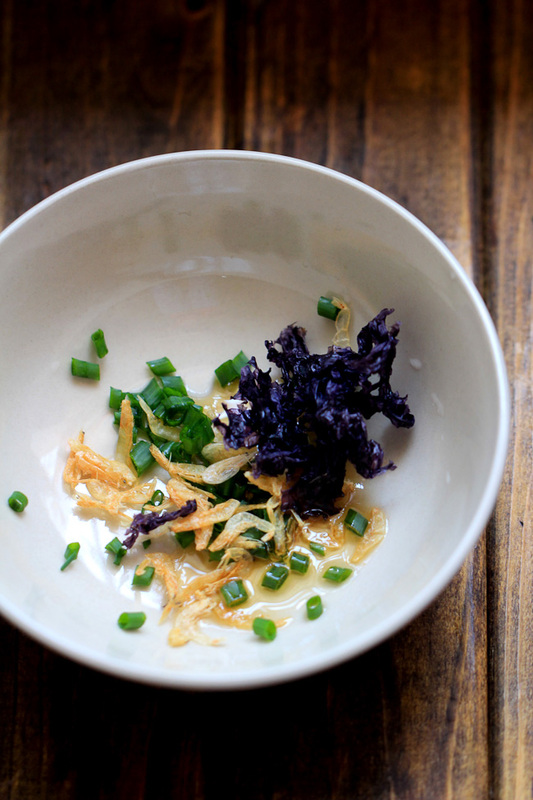 Before boiling the wonton, prepare your serving bowls. 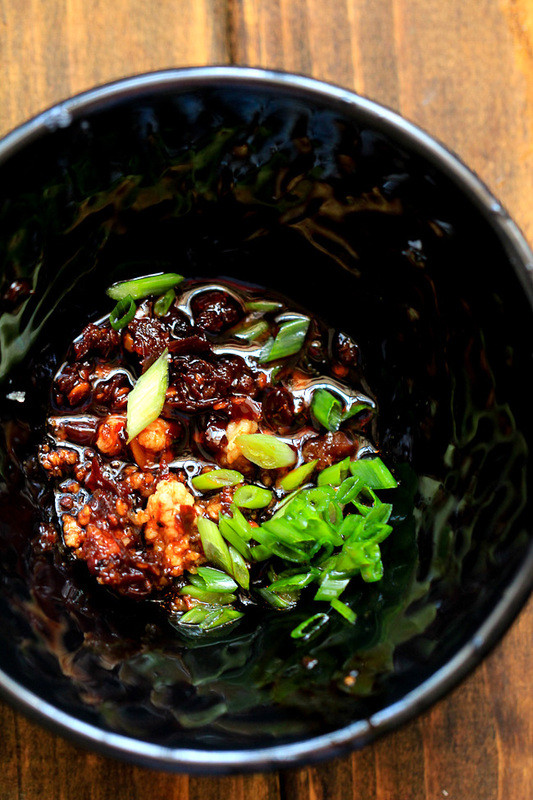 Add minced garlic, sesame oil, salt, soy sauce, vinegar, chopped green onions and chili oil (Instruction listed here: how to make Chinese red oil) in one bowl for spicy wonton soup and add sesame oil, salt, chopped green onions, dried sea shrimp and dried seaweed(optional) for mild wonton soup. Bring a large amount of water in pot and cook the wontons for around 5 minutes and cook your vegetables in the last one minute. To make the filling: In a large bowl, well combine all the ingredients together. Then stir your meat filling in one direction until the filling becomes sticky. To assemble the wontons: Put the wonton wrapper in the center of the left hand. Spoon about 1 teaspoon of meat stuffing (or slightly more if you want)onto the center of the wrapper. Moisten the edges of the wonton wrappers with water. Fold one corner of the wrapper over the opposite corner to make a triangle just like the picture shows. 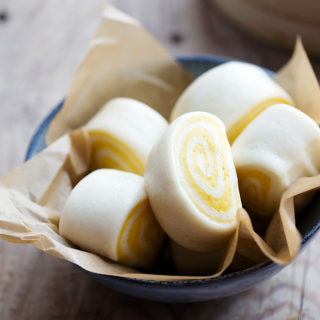 Hold the wrapper with both hands, curl the corner on the right hand in firstly and then the curl the corner on the left hand to seal with another corner. You can also change the sequence. But make sure that you press them firmly. To prepare your serving bowls: in separate serving bowls, mix all the seasonings and set aside. Boil water in a wok. Put the wonton in to cook for about 5 minutes.And add your vegetable leaves prepared to cook in the last 1 minute. scoop around 1/2 bowl of the boiling water in serving bowl (or you can use stock), and then place wonton in too. Even with water, the soup tastes good. But you can use chicken or pork stock to replace water. Oh this is wonderful! I saw this recipe several days ago and have been thinking about it ever since. I am teaching a friend to cook and I think this soup might just be perfect. Thanks! Thanks for stopping by and I am really happy you love this recipe. I hope you and your friend will enjoy it. Thanks for all of your kind word and you are such a nice boyfriend. But I am quite sorry that I do not think I can make this Shanghainese version of Jian Bing at home. Are you talking about Jianbing like Xiaoling Jianbing or Jianbing with Youtiao wrapped? I don’t see how much fresh ginger. I probably missed it, but couldn’t find it. I am sorry that I did not figure that clearly. Ads for the fresh ginger, you may look into the picture showing about making the meat stuffing. It is around 2 teaspoons of mashed ginger. Soaked in clean water to get the ginger sauce. Thanks very much for your correction! I have already added it into ingredients list. I made this, it was absolutely delicious! I had to make my own won ton wrappers so that made it a little time consuming, but with store-bought wrappers it is pretty easy and SO tasty! We don’t have chicken essence readily available in the US so I used part chicken stock and part water to cook the wontons in. The won tons and the broth were both delicious. Thanks so much for your feedback and I am really glad to know that you love it. That’s a pretty nice idea to cook with chicken stock. If I have chicken stock available, I will use it too. Thanks again for your lovely feedback. Margaret, I’m not entirely sure if it’s exactly the same, but I would imagine that “chicken essence” is not much different than “chicken bouillon” in U.S. supermarkets. It is often in the aisle with other spices and herbs. A common brandname is Knorr. Thanks Jing for your explanation. Hi! Are we supposed to add liquid or broth to the ingredients listed under sauce for the soup? It doesn’t seem like a lot of liquid. Lucy, yes! Please add some broth or water for boiling the wonton. I love to have this dish in the restaurant, but sometimes it’s just too spicy for me.It’s a good idea to cook it at home, that you can adjust the spiciness yourself. Your wonton wrappers looks nice and tasty. The ones I got in the supermarket are quite thick. I sometimes roll it to thinner ones, but so time consuming! That’s true. Restaurant styles usually are not the most suitable versions. In my area the large grocery stores carry what is called Wonton Wrappers and Egg Roll Wrappers in the produce section. I do not recommend them – they are just too thick. Try to find frozen ones, but not all grocery stores carry them. If you find an Asian market, they also sell frozen ones and if not they certainly have the round ones for gyoza or dumplings which would probably be better than the extra thick ones. I am curious on How do I make the Chicken Essence. Or what is it! 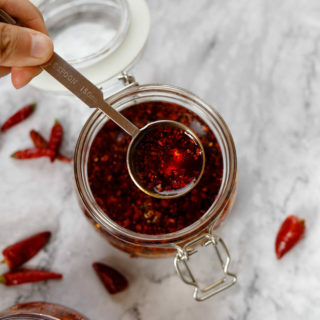 Your Eonton Recipe, spicy one looks Delicious!! Can’t wait to try it. 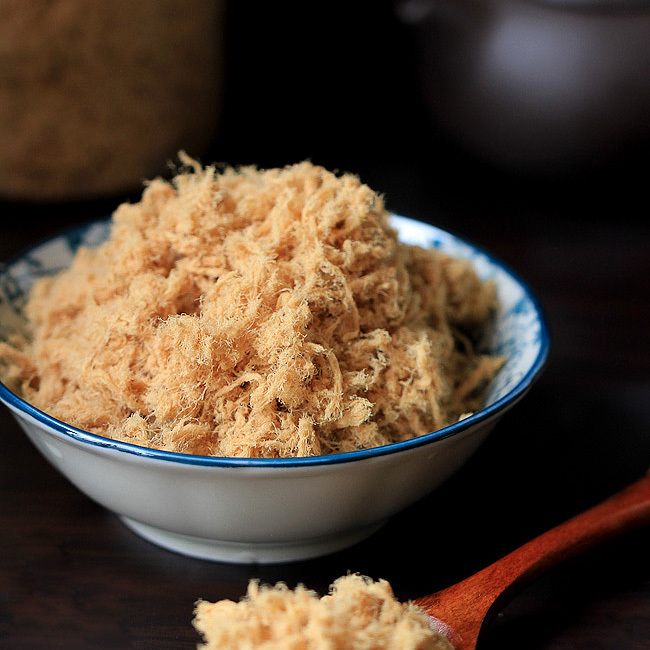 Chicken essence is similar to chicken powder and it is a common Chinese seasoning. If it is not available,you can use chicken broth to cook the wonton or simply skip it. I am in search of a spicy broth for wonton soup and yours looks perfect. My only question is that I am looking to make a large pot of the broth and am not sure how to go about it with your directions listed above. I plan on adding some vegetables and wontons to the broth as the finishing touch. I have a large family so making a large pot and not individual servings would be ideal. How much water or broth do you reccomend using for the amount of spices you listed for each bowl. Would you say about a cup of water per bowl? Or more? I will recommend adding water to cover all the wontons at least. So the amount is depending on the serving bowl. It is ok to serve the wonton in a large pot, just add the spices little by little and taste during the process. made the spicy version of this recipe exactly as written and loved it. Thanks! You are the most welcome. Suma. Glad to hear the positive feedback. Receive my warmest greetings from Panama. I really love your amazing blog and have tried some of your recepies!. 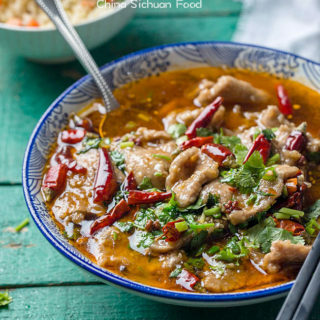 I’m looking for place in Sichuan to learn more about Sichuan cuisine and techniques. Any recommendation? Sorry that I cannot provide valuable suggestions. I only heard Xin Dong Fang. Can you read and speak Chinese? Is the sauce recipe for a single serving? Yes,the sauce is for single serving. I knew that there had to be a good scratch version of wonton soup. Can’t wait to try this! 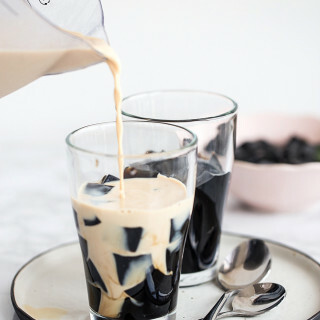 What is the Black Vinegar you are using? or is there a brand name I can look for in a Asian Store? The only dark vinegar I see at the U,S. grocery stores, I’m unsure if they are suitable for this recipe. I have a Aged Balsamic Vinegar which is a sweet vinegar would that be something I can use? 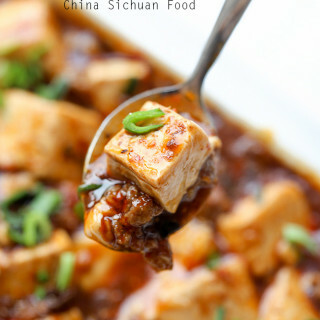 I would like to try this recipe exactly how it is written, I have everything to do it but, I’m unsure about the vinegar. Thank you for having a Comment and reply box to get help. 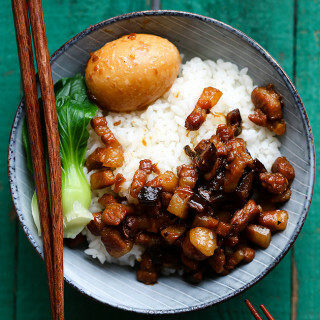 Only dark vinegar from Asian store can work for this recipe. It does not hold a high standard. However aged balsamic vinegar cannot work. I made both versions last night for guests. A huge success! One guest wanted his spicy but not too much, so I only put about 1/2 tsp chili oil in his. For the mild version I only had Dashi and not shrimp powder but it certainly was delish. Don’t know if that made much difference in flavour? For the seaweed I had some old dried up Nori sheets that I crumbled into a couple of flakes. Making the individual bowls is a wonderful way. I placed the bowls on a tray and added the seasonings one by one. I had Baby Bok Choy which I cut off the greenery, halved the white part and adding them at the same time as the Won Tons to the boiling water, added the greens at the last moment. To serve, I put in the Won Ton (I also love this version, very tasty), then the Bok Choy and a ladle full of boiling water. Gave each bowl a quick stir and took the tray into the table. I just had to remember which bowl was for who! LOL. Elaine, I thank you, thank you, thank you… for so doing many of your recipes for 2. It is hard to find exciting recipes and then ruining them trying to cut in half. Thanks for your lovely comment. I know that lots of you make wonton soup in a large soup pot. But yes, make small bowls are so wonderful. 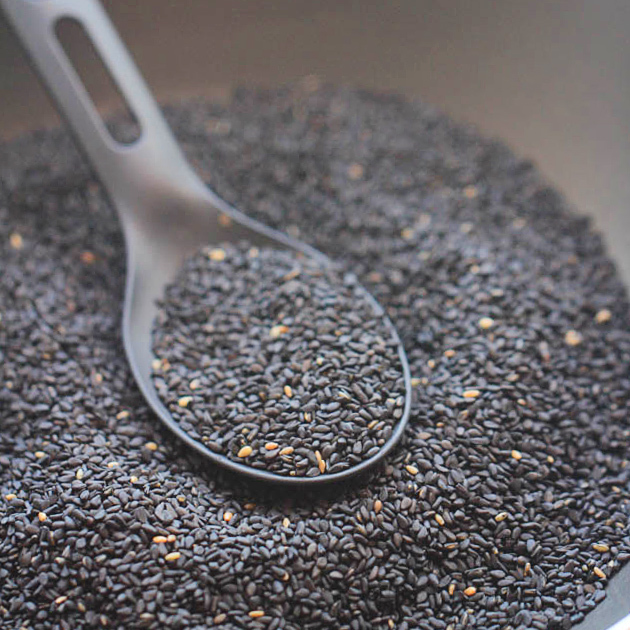 Seasoning can be adjusted by personal preferences and the seasonings are much more well combined. It is ok to skip the shrimp. Happy cooking and I hope you will like other recipes too. Great recipe! My family loved it and I will be making it again for sure. I added some of my own flare to the recipe but it’s fantastic by itself. My suggestion would be to add a tsp of corn starch to the meat stuffing for it to be a less dry and more tender. Yes, Yeming. Adding cornstarch can be helpful. 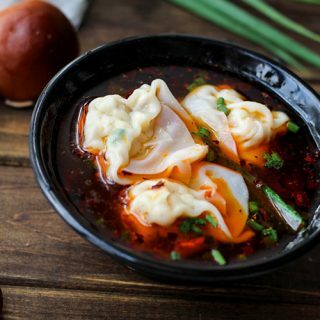 I have just discovered your website and this wonderful recipe for wontons in red oil sauce. I look forward to making this and many other of your recipes. 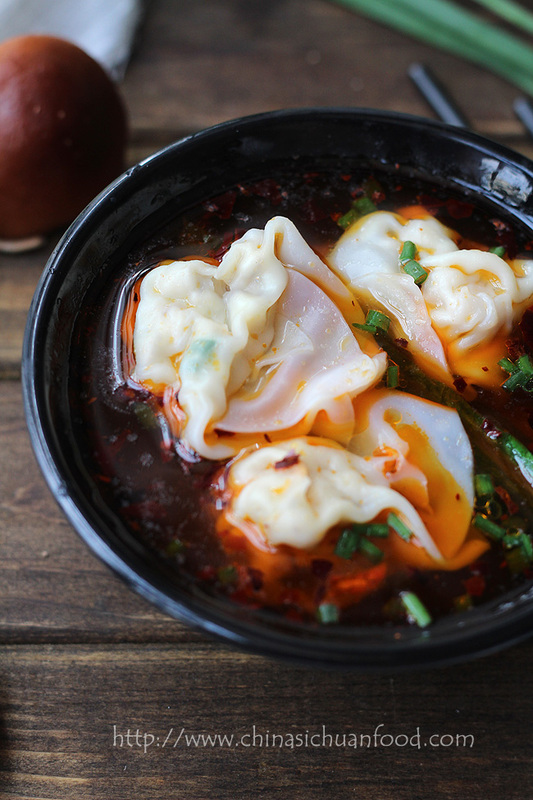 Can you tell me the chinese name of this wonton dish? Hi Chris, it is “馄饨”.